July 8 at S. Poplar Ave.
July 12 at E. Upland Ave.
Tonya K. Taylor, 33, of Williamstown was arrested by Ofc. John Mooney for theft on July 7. Richard M. Barber, 37, of Galloway was arrested by Ofc. Kevin Costa for possession of heroin on July 8. Kimberly A Faunce, 38, of Galloway was arrested by Ofc. Bill Kline for possession of heroin on July 8. Jazmin L. Dewitt, 20, of Galloway was arrested by Ofc. Steve Vernon for improper behavior on July 8. Christopher J. Love, 39, of Philadelphia, PA. was arrested by Ofc. Justin Butler for possession of CDS on July 8. Andrew J. Weil, 30, of Mullica Twp. was arrested by Ofc. Przemyslaw Ryba for possession of CDS, drug paraphernalia and possession of hypodermic needle on July 9. Diana Diaz, 24, of Egg Harbor City was arrested by Det. Brian Casey for possession of CDS and distribution of prescription legend drugs on July 10. Marquette A. Winters, 33, of Galloway was arrested by Det. Brian Casey for possession of CDS and distribution of CDS on July 10. Donald T. Powers, 56, of Galloway was arrested by Ofc. Kerry Baerman for cruelty to animals on July 12. Roberto E. Alicea, 23, of Galloway was arrested by Ofc. Scott Winneberger for possession of CDS on July 12. Michael Arrington, 30, of Atlantic City was arrested by Ofc. Scott Winneberger for possession of less than 50 grams of marijuana on July12. Jody W. Pendleton, 37, of Philadelphia, PA, was arrested by Ofc. Ronald Gorneau for possession of CDS, hindering apprehension and criminal simulation on July12. Alexa M. Milano, 29, of Ventnor was arrested by Ofc. Ronald Gorneau for possession of less than 50 grams of marijuana and possession of drug paraphernalia on July 12. 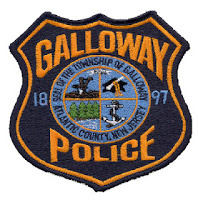 David T. Skeele, 18 , of Galloway was arrested by Det. Jason Kiamos for burglary, theft and criminal mischief on July 13.